Compared to improved temperate pastures, the stocking rates, production/ha and reproductive rates are lower with tropical pasture and forages. The nutritional problem centres around reduced total dry matter intake (TDMI) of pastures with lower levels of key nutrients, ie energy and protein and periodically low-marginal intakes of macrominerals. Macrominerals are essential for the proper functioning of the animal and problems occur when the supply of key minerals do not meet the animals requirements. This may occur because the feed is low in minerals, the availability of the mineral is low or other minerals in the diet are antagonistic to mineral absorption by the animal. A time factor is usually involved with mineral deficiencies. It may take from weeks to several months for a mineral deficiency to show symptoms but production can be compromised in the meantime. Many variables affect an animal’s mineral intake including soil and plant mineral compositions, climate, disease, stress and the production status of the animal. Macrominerals are those that are required in relatively large amounts. This group consists of calcium (Ca), phosphorus (P), magnesium (Mg), sulphur (S), potassium (K) and sodium (Na). This article outlines the macromineral requirements for beef cattle and discusses those minerals that most influence production and reproduction. The macromineral requirements of beef cattle are shown in Table 1. Caution should be exercised when estimating and supplying mineral requirements because of the many interactions and ratios associated with various minerals. Furthermore, excess mineral supplementation can lead to mineral imbalances, reduce the absorption of minerals and cause toxicity problems. Approximately 70 percent of soils in Northern Australia are phosphorus deficient and phosphorus deficiency is probably the most common nutritional deficiency with cattle grazing tropical and subtropical pastures. Phosphorus is present in many parts of the animal’s body and is an important part of chemical reactions involved in energy metabolism and transfer. Phosphorous requirements are subject to growth and production status with highest requirements for growing young stock and cows in their early lactation (Table 1). Phosphorus works in conjunction with calcium because of their mutual roles in bone formation and metabolism. The recommended calcium to phosphorus ratios in beef cattle diets is 1.5Ca:1P to 2Ca:1P. Deficiency of phosphorus results in decreased animal performance, including reduced weight gains, poor reproductive rates, low milk production and poor calf growth rates. Requirements are based on NRC 2000 recommendations. The values are expressed as a proportion of the total diet. Formulations greater than 6-8 percent phosphorus may be unpalatable unless feed byproducts are added. Provide additional salt if mineral intake is excessive. 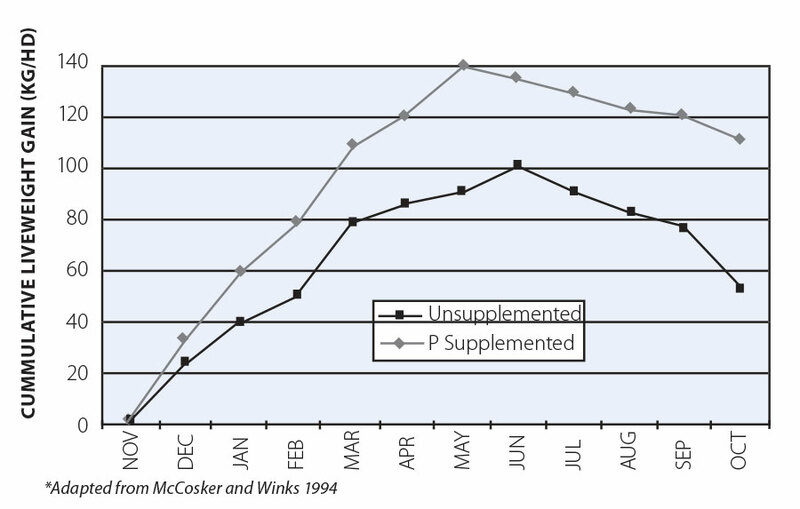 Macromineral intake is expressed as a percentage of TDMI and micromineral whole as ppm in the TDMI. In the past phosphorus has been over supplemented to address deficiencies with excretions of excess phosphorus. Excess P does not compromise animal performance providing the correct Ca:P ratio is maintained. Like calcium, phosphorus requirements are generally met in immature-growing pastures. 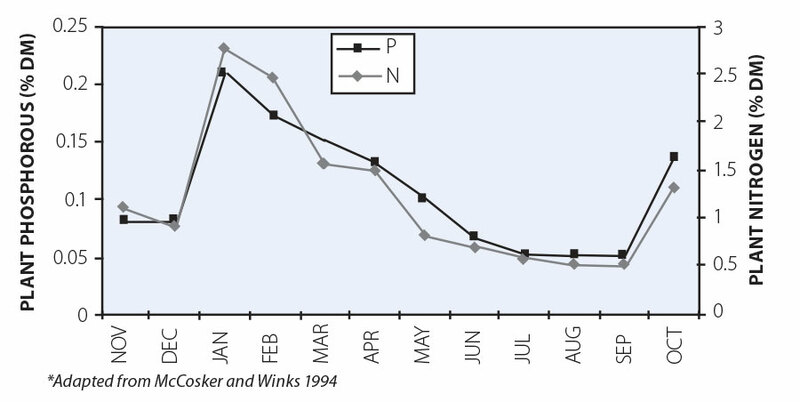 P shortages occur in mature dormant and drought stricken pastures (Fig 1 and 2). Greatest responses to phosphorus supplementation is only obtained when P is the primary limiting nutrient. It is common that phosphorus pasture levels in the wet season are 1:8-2.4gms/kg DM. Studies show that despite adequate P intakes in the wet season, there are positive responses to phosphorus supplements due to the higher P requirements for increased growth and milk production due to higher intakes of energy and protein. Mature cattle can draw on phosphorus reserves in the bones but skeletal phosphorus must be replenished. Additional phosphorus in the wet period assist stock to replenish their depleted bone reserves. Frequently, due to convenience, phosphorus is supplemented in the dry periods when P levels in pastures are low. Responses however to P supplementation are compromised unless there are additional sources of energy and protein (eg fortified mineral supplement, vegetable protein, molasses and urea). Dietary deficiencies of P may be rectified by direct supplementation or the application of superphosphate fertiliser to pastures. Research in Queensland has shown that the addition of superphosphate to grass-legume pastures increased animal production due to the higher proportion of legumes in the diet providing higher intakes of energy and protein. Studies suggest that the compounds of superphosphate, Ca, P, S either singularly or in combination influenced plant composition and digestibility increasing total dry matter intake (TDMI) with increased intake of total digestible nutrients (TDN) thus improving animal production. Forages are generally lower in P content than concentrate feeds (eg cereal grains, cottonseed meal). Phosphorus levels are low in stored matured forages and due to reduced TDMI phosphorus supplementation is required. Sources of supplemental P include dicalcium phosphate in grain mixes and phosphoric acid in molasses-urea-protein supplements. The most important feature of calcium nutrition is the ratio of calcium to phosphorus. The ideal Ca:P ratio is 1.5C:1P to 2Ca:1P, If the ratio of phosphorus exceeds calcium, the absorption of calcium in the digestive tract is reduced and the animal will mobilise calcium from the bone. Critical times to ensure that diets contain adequate calcium levels are during pregnancy (for proper bone growth of the foetus) and during early lactation to prevent excessive Ca metabolism from the bone of lactating cows. Excessive Ca metabolism from the skeletal system of the cow (particularly high producing mature cows) can lead to milk fever. Phosphorus levels in plants are closely aligned with plant energy and protein levels ie nitrogen concentrations peaking in the growing season and declining in mature and dormant pastures. Limitations of other minerals (eg Ca, Cu, Co, Mo, Se and Zn) may also limit animal responses to P Supplements. Even with adequate P in green pastures, the performance of animals increases with P supplements due to the higher mineral requirements caused by increased production. Greatest responses to P supplements occur when other minerals and nutrients (energy and protein) are not deficient. Calcium requirements change depending on the animals age and production status (Table 1) eg non lactating cows require approximately 20 per cent less calcium than cows heavy in milk. Calcium is generally adequate in forages (especially legumes) but phosphorus can be marginal and a mineral supplement that is higher in P than Ca is necessary to keep the P ratio in the desired range (Table 3). If the Ca:P ration exceeds 10:1 or phosphorus remains deficient reduced growth, feed efficiency and reproduction will result. Cattle can tolerate high calcium concentrations if other minerals are adequate in the diet. For cattle on a high concentrate diet, the opposite problem exists. Most cereal grains are higher in P than Ca and calcium must be added to high grain-low roughage diets (Table 3). When the Ca:P ratio approaches 1:1 or P intake exceeds Ca, reduced feed intake can result. Sources of calcium supplements include calcium carbonate, limestone, dicalcium phosphate, monocalcium phosphate and calcium sulphate. Limestone is approximately 36 per cent calcium and is commonly used in grain supplements. Dicalcium phosphate is approximately 20 per cent calcium and 19 per cent phosphorus and is often used in diets to balance the Ca:P ratio. Common salt is 49 per cent sodium. Sodium is an important element used to maintain water balance and volume, contracting muscles, transmitting nerve impulses, carrying glucose and amino acids and is necessary for the operation of some enzyme systems. The advisable level for sodium is 0.06% for weaners, 0.08% of the TDMI for dry cows and 0.10-0.15% for lactating cows. The first effect salt deficiency is reduced milk production and Na is an essential part of milk and milk secretion. High levels of salt can be tolerated by cattle providing there is an adequate supply of low salt water. High intakes of salt have been shown to decrease feed intake and weight gains. The maximum tolerable is estimated at 6.0 per cent of TDMI. High salt levels in drinking water (1.5-2.0 per cent) can result in reduced feed intake and weight gain, digestive disturbances and diarrhoea. Forage sodium content varies considerable and cereal grains and protein meals are typically low in salt content. Studies of 10 different tropical grasses in South East Queensland and a separate study in North East Queensland showed that tropical pastures were consistently low in sodium. Subsequent studies with tropical grasses and sodium supplements found that cattle had increased weight gains and increased milk production resulting in increased growth rates of the calves. Cattle will consume more salt when the forages are young and succulent compared to rank-mature pastures. Silage fed cattle have higher intakes of salt compared to hay fed cattle. The consumption of salt is higher in high roughage-low grain diets compared to low roughage-high grain diets. Sulphur is present in protein and certain vitamins and other organic compounds. Sulphur is used in detoxification reactions and is required by rumen microorganisms for growth and normal cell function. Diets in beef cattle require 0.15 per cent sulphur and dietary levels above 0.4 per cent are potentially toxic. Excess sulphur interferes with the metabolism of selenium, copper, molybdenum and thiamine (B vitamin). Sulphur toxicity is characterised by restlessness, diarrhoea, muscle twitching and laboured breathing. In severe cases there is inactivity and death. Note: Whilst there is limited information on tolerance levels to excess calcium levels, it is important to ensure that other minerals are not limiting. Sulphur deficiencies reduce feed intake, microbial protein synthesis depressing growth and weight gains. Deficiency signs are weight loss, weakness, profuse salivation and death. Studies suggest that sulphur supplementation of tropical pastures particularly mature pastures improved total matter voluntary intake (TDMI) and forage digestibility resulting in the intake total digestible nutrients (TDN). Cattle grazing pastures on sulphur deficient soils (eg basalt) respond to sulphur supplements. Cereal grains are generally lower in sulphur than protein meals. Diets comprising of high levels of tropical forages particularly mature forages and forages grown in sulphur deficient soils respond to S supplements. Diets involving corn silage and in rations where true proteins are replaced with non protein nitrogen (eg urea) sulphur supplements are necessary. Bore water can provide a high source of sulphur and often are responsible for excess intakes of sulphur. Sulphur supplements include sodium sulphate, ammonium sulphate, calcium sulphate, potassium sulphate and magnesium sulphate. Like sodium, cattle require potassium in large amounts for normal functioning. Potassium is involved in acid base balance, osmotic pressure regulation, water balance, muscle contractions, nerve impulse transmission, enzyme reactions and oxygen and carbondioxide transport in the blood. Potassium deficiency results in non specific symptoms such as poor appetite, lowered body weight, rough hair coat and muscle weakness. The body stores of potassium are low so K deficiencies can happen quickly. Most pastures, particularly mature grasses, contain adequate levels of potassium. Temperate grasses and clovers contain excess levels of K which inhibits Mg absorption and can accelerate the onset of grass tetany requiring magnesium supplements. Tropical legumes and forages and conserved feeds made from those plant are relatively low in potassium and when fed with grain supplements require potassium supplements. Concentrate rations comprising of grain and plant proteins are low in potassium (0.30-0.60 per cent) and in high grain-low roughage diets particularly when the roughage comprises of tropical grasses and forages, potassium supplements are recommended. In mature and dormant pasture or pastures receiving high rainfall which leaches K from the plant, potassium supplements may be beneficial particularly if high levels of grains are fed. Potassium levels of 0.6-0.7 percent are necessary for optimal performance and in most instances a mineral supplement containing 1.0 percent potassium can remedy deficiencies. Cattle stressed due to transporting long distances can respond positively to K supplements to replenish lost body reserves. Approximately 65-70 percent of magnesium in the body is found in bone, 15 percent in muscle, 15 percent in other soft tissue and 1 percent in extracellular fluid. Magnesium is important for enzyme activation, glucose breakdown, nerve impulse transmission and skeletal development. Forage magnesium levels depend on plant species, soil Mg levels and stage of plant growth. Legumes usually contain more Mg than grasses. Whilst most forages usually contain adequate levels of Mg, immature-lush pastures generally have low levels of Mg which can lead to grass tetany requiring Mg supplements. Symptoms of grass tetany include frequent urination, erratic behaviour, convulsions and, if left untreated, lead to death. Young cattle can mobilise large amounts of Mg from bone but mature cattle are unable to do this and must receive adequate supplies from the diet. Mature beef cows in early lactation are prone to grass tetany when grazing lush temperate grasses and legumes. Prevention of grass tetany and Mg shortfalls involves mineral mixtures containing magnesium oxide and/or magnesium sulphate with suitable levels of salt. Animals with grass tetany respond to an intravenous injection of calcium-magnesium gluconate. In general Mg toxicity is not a problem with beef cattle with concentrations up to 0.4 per cent being tolerated. Excessive Mg intake can result in severe diarrhoea, sluggish appearance and reduce feed intake. Cereal grains contain approximately 0.11-0.17 per cent Mg and plant protein meals can be twice as high. It is recommended that cattle grazing lush temperate pastures and a grain supplement are provided Mg supplements (eg magnesium oxide). Magnesium oxide is also a suitable buffer when cattle are introduced to grain diets. Magnesium sulphate and magnesium oxide are good sources of Mg. Supplements can be offered at 2-4 per cent of the supplement but increased to 10 per cent if grass tetany is suspected. High levels of Mg supplements can however lead to increased feed refusals of grain supplements. Macrominerals are responsible for important physiological functions in beef cattle and therefore must be supplemented when the diets are deficient or when there are incorrect balances of minerals. Macrominerals are required in relatively large amounts compared to microminerals and are often expressed as a percentage of total dry matter intake (TDMI) or as gms/kg. The main macrominerals required by beef cattle are phosphorus (P), potassium (K), sulphur (S), magnesium (Mg), sodium (Na) and calcium (Ca). Recognise that responses to mineral supplements depends on other nutritional factors eg sufficient levels of energy and protein in the diet when supplementing phosphorus. Nutrition – Acidosis & Additives - ABBA Brahman News, December 2013 pp. 46-48. Health – Immune Systems and Micronutrients for Beef Cattle – ABBA Brahman News, September 2016, pp. 48, 50, 52, 54. Sulphur supplementation if necessary can be provided using sulphate found in other minerals (eg sodium sulphate, calcium sulphate, potassium sulphate, magnesium sulphate). Note: Total mineral intake depends on the digestibility and quality of the feedstuff. Subsequently, lower mineral intakes are experienced with tropical grasses, forages and legumes compared to temperate pastures and energy and protein supplements.